Cannas, also called canna lilies, are tropical flowering plants with large, showy foliage and red, yellow or orange flowers. Cannas are grown from rhizomes, which are actually horizontal stems that send out roots and shoots of growth from their nodes. Although native to tropical climates, canna plants can be successfully grown in temperate climates with proper care and maintenance. Plant canna rhizomes directly in the ground, four to five inches deep, in early spring after all threat of frost has passed. Plant potted plants in the ground during the spring or summer months. Plant cannas in an area that receives full sun and has moist, rich soil. Water cannas thoroughly after planting and at least once a week until cool temperatures halts growth. 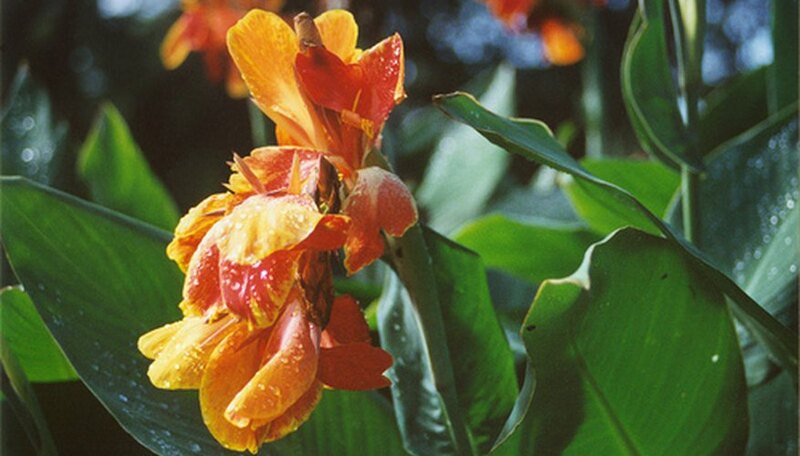 Canna lilies grow in wet, poorly drained and swampy soil, but they perform best if the soil is kept moist. Never allow the soil to dry out completely and water when the first few inches of soil feel dry to the touch. Apply a balanced all-purpose plant fertilizer to the soil around your canna plants once in spring and again in mid-summer. Refer to the manufacturer's instructions for proper dosage and application. Remove any spent flower blooms as soon as possible to promote the growth of new flowers. Pinch off dying blooms with your fingers as close to the stem as possible. Further pruning of cannas is unnecessary. Dig up canna rhizomes in the fall if you live in an area with cold winters. Cut the canna plant back to about six inches after the first real frost . Use a garden spade to remove the rhizomes from the ground and place in a dry place for several hours to cure. Transfer rhizomes to a mesh bag and store in a cool (40 to 50 degrees F) area until the next spring. Large clumps of canna rhizomes can be divided before replanting the following year. Use a garden spade or shovel to separate the smaller buds from the main rhizome and plant each bud as a separate plant. In warm climates, cannas may be left in the ground year 'round to reappear each spring. How Do I Winterize Canna Lily Bulbs?